If you are a world traveler and gambler, the book is just for you. 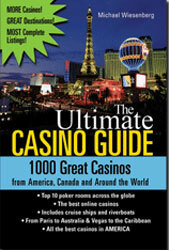 It includes much information on dozens of casinos all over the world. It is worth praising as the author has worked hard on it. Even if you are not travelling much, you can travel in cyber ship called the Internet and play at different casino of different directions. Except for the information on the best land based casinos, there are descriptions of the poker rooms, online casinos. Author also talks about the cruise ships and riverboats, where gambling is widely spread as well. The contents are divided into the chapters, according to the geographical location. It is the book written by a professional poker player. He started as a technical writer in the computer sphere. But then he went further and became a gambling writer and a successful poker player. It is a real casino guide that actually guides and not confuses the readers. He is taking to an around-the-world-trip. He starts with North America and ends with Oceania stopping in Europe, Asia and Africa. Talking about the chapter "How to Use This Book" that makes us feel more comfortable, as the author is telling the most important aspects of gambling in every country. If you need to know what a currency exchange is, he enlightens this information also. Also author covers the peculiarities of the gambling in every city and country. It is a real guide, as he brings information on the name of the gambling establishment, its address, phone number and website so that you would be able to check that out. Email is also included. Wiesenberg describes the house itself, how it looks and what to expect. It is a complete book but you can add some interesting things like casino myths. In the slot machine area he gives information on the quantity of the machines in the casino, betting ranges, which is also important. Jackpot rates are vitally important and they are also mentioned. The same thing concerns the table games, including the table limits. Some of the games are called differently, so you can look up that name in the glossary section. If you get tired from gambling info, there is always open hours, entertainment and restaurants section which will also be extremely useful for you. And he goes on and on. It is like American Casino Guide by Steve Bourie but this one includes more information that is relevant to most part of the world.